We are designed to safely enhance your driving experience with 10W/7.5W/5W fast wireless charging function. Just slip down your phone and go. Enjoy the convenience of effortless phone viewing, wireless charging and GPS navigation. All standard Qi-enabled devices, such as Lumia 1520/930/928/920/830/735, HTC 8X, LG G4/3/2, NEXUS 7/6/5/4 and more. Note: Please insert the BOSLISA car charger into your vehicle's 12-volt power outlet. 1. DO NOT DIRECT HEATED AIR FROM THE VENT ONTO THE VENT MOUNT WHILE IT IS ATTACHED TO THE VENT. 2. Do not store device in high-temperature environment. Do not place device in fire or other excessively hot environments. 3. Do not disassemble this device or attempt to re-purpose or modify it in any manner. 4. Do not attempt to power this device using any method, apparatus, or connection other than the device's micro-USB connector. 5. For best performance Phone case should no metal ring,no metal plate, no credit card. 【Powerful Three Wireless Charging Modes - 10W/7.5W/5W】- 2018 Upgrade Version: Boslisa Car Phone Charger can automatically match three corresponding wireless charging mode according to different smart phones. 10 W fast charge for QC 3.0 Samsung Galaxy S9/S9plus/S8/ S8plus/S7/S7 edge/S6 edge+/Note 5; 7.5W fast charge ; Standard 5W for all Qi compatible devices. 【Stylish LED Lights & Metallic Cooling System】- Smartly designed LED indicator light clearly indicates the standby status (RED) and charging status (BLUE). Solid aluminum shell and built-in large coils guarantees fine heat dissipation as well as reliable charging experience. 8mm long distance interaction - no need to remove your cell phone case, easy put to wireless charge. 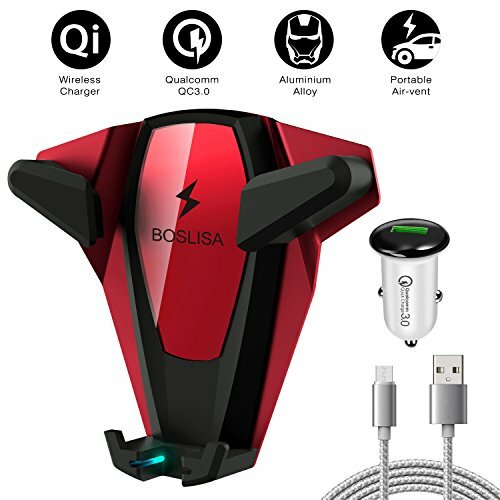 【Intelligent Chip with Reliable Protection】- Boslisa car charger can detect the voltage of your devices intelligently so as to apply different wireless charging speeds, up to 90% charging conversion. Build-in Over-Temperature Protection, Over-Voltage Protection, Over-Current Protection, Short-circuit protection keeps your smart phone safe comprehensively. 【Package & Warranty】You will get 1x Qi Wireless Charger Car Mount, 1x Air Vent Clip, 1x Nylon Braided Micro USB Cable, 1x QC 3.0 Car Charger(*Gifts), and 1 x User Manner. NO-Hassle three months money back/replacement warranty with 12-hour response service is friendly offered. At Boslisa, ZERO Risk purchase guarantee is for every customer's smiles. If you have any questions about this product by BOSLISA, contact us by completing and submitting the form below. If you are looking for a specif part number, please include it with your message.